ROCK TAMERSTM are the premiere "Adjustable and Removable" Mudflap System designed to provide the ultimate protection for your towables from damage caused by rocks and road debris. They are the perfect solution for consumers who want the utility aspect of mudflaps and want to maintain their vehicle's stylish and attractive appearance. This patented system is easy to attach or remove from any standard 2" ball mount. The overall width is adjustable from 66.75" to 97" and easily fine-tuned to fit any full size or dually truck. The mudflap height is adjustable to maintain consistent ground clearance when towing various loads. 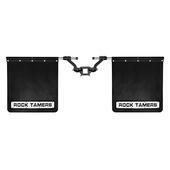 ROCK TAMERS are made of top quality materials and components. ENKAY Rock Tamers™ are the ultimate adjustable and removable mudflap system. The workmanship and design considerations translate into a truly unique product. ROCK TAMERS are designed to provide the ultimate protection for your towables from damage caused by rocks and road debris. They are the perfect solution for consumers who want the utility aspect of mudflaps and want to maintain their vehicle's stylish and attractive appearance. Data generated in 0.649177 (s) from 30 queries.